Carbonated water is a refreshing beverage and a good alternative to sugary soft drinks. However, concerns have been raised that it may be bad for your health. This article takes a detailed look at the health effects of carbonated water. This produces a bubbly drink that’s also known as sparkling water, club soda, soda water, seltzer water and fizzy water. With the exception of seltzer water, carbonated waters usually have salt added to improve the taste. Sometimes small amounts of other minerals are included. Natural sparkling mineral waters, such as Perrier and San Pellegrino, are different. These waters are captured from a mineral spring and tend to contain minerals and sulfur compounds. These waters are often carbonated as well. Tonic water is a form of carbonated water that contains a bitter compound called quinine, along with sugar or high-fructose corn syrup. Carbon dioxide and water react chemically to produce carbonic acid, a weak acid that’s been shown to stimulate the same nerve receptors in your mouth as mustard. This triggers a burning, prickly sensation that can be both irritating and enjoyable (1, 2). The pH of carbonated water is 3–4, which means it’s slightly acidic. However, drinking an acidic beverage like carbonated water does not make your body more acidic. Your kidneys and lungs remove excess carbon dioxide. This keeps your blood at a slightly alkaline pH of 7.35–7.45 regardless of what you eat or drink. SUMMARY Carbonated water is acidic, but your body should maintain a stable, slightly alkaline pH no matter what you consume. One of the biggest concerns about sparkling water is its effect on teeth since your enamel is directly exposed to acid. There is very little research on this topic, but one study found that sparkling mineral water damaged enamel only slightly more than still water. Furthermore, mineral water was 100 times less damaging than a sugary soft drink (3). In one study, carbonated beverages showed strong potential to destroy enamel — but only if they contained sugar. In fact, a non-carbonated sweet beverage (Gatorade) was more harmful than a carbonated sugar-free drink (Diet Coke) (4). Another study placed samples of tooth enamel in various beverages for up to 24 hours. The sugar-sweetened carbonated and non-carbonated beverages resulted in significantly greater enamel loss than their diet counterparts (5). A review of several studies found that the combination of sugar and carbonation may lead to severe dental decay (6). However, plain sparkling water appears to pose little risk to dental health. It’s only the sugary types that are harmful (7). If you’re concerned about dental health, try drinking sparkling water with a meal or rinsing your mouth with plain water after drinking it. SUMMARY Sugar-sweetened carbonated beverages can erode tooth enamel, but plain carbonated water appears relatively harmless. Carbonated water may benefit digestive health in several ways. Studies suggest that sparkling water may improve swallowing ability in both young and older adults (8, 9, 10). In one study, 16 healthy people were asked to repeatedly swallow different liquids. Carbonated water showed the strongest ability to stimulate the nerves responsible for swallowing (9). In a study in 72 people who felt a persistent need to clear their throats, drinking ice-cold carbonated water led to improvement in 63% of participants. Those with the most frequent, severe symptoms experienced the greatest relief (11). Carbonated water may also extend the feeling of fullness after meals more than plain water. Sparkling water may help food remain longer in your stomach, which can trigger a greater sensation of fullness (12). In a controlled study in 19 healthy young women, fullness scores were higher after the participants drank 8 ounces (250 ml) of soda water than after still water (13). In a two-week study in 40 elderly people who had suffered strokes, average bowel movement frequency nearly doubled in the group that drank carbonated water compared to the group that drank tap water. What’s more, participants reported a 58 percentdecrease in constipation symptoms (14). One controlled study examined 21 people with chronic digestive issues. After 15 days, those who drank carbonated water had significant improvements in digestive symptoms, constipation and gallbladder emptying (15). SUMMARY Carbonated water has benefits for digestion. It may improve swallowing, increase feelings of fullness and reduce constipation. Many people believe that carbonated beverages are bad for bones because of their high acid content. However, research suggests the carbonation isn’t to blame. A large observational study in over 2,500 people found that cola was the only beverage associated with significantly lower bone mineral density. Carbonated water appeared to have no effect on bone health (16). Unlike carbonated water and clear soda, cola drinks contain a lot of phosphorus. The researchers proposed that the cola drinkers may have been consuming too much phosphorus and insufficient calcium, providing a potential risk factor for bone loss. In another study, teen girls who consumed carbonated drinks were found to have lower bone mineral density. This was attributed to beverages that replaced milk in their diet, resulting in inadequate calcium intake (17). 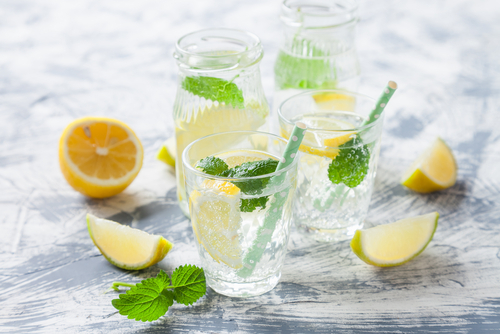 In a controlled study in 18 postmenopausal women, drinking 34 ounces (1 liter) of sodium-rich sparkling water daily for eight weeks led to better calcium retention than drinking plain mineral water (18). Additionally, no negative effects on bone health were observed in the sparkling water group. Animal research suggests carbonated water may even improve bone health. Supplementing hens’ diets with carbonated water for six weeks led to increased leg bone strength compared to tap water (19). SUMMARY Drinking carbonated cola drinks may harm bone health, but plain sparkling water appears to have a neutral or positive effect. Research suggests carbonated water may improve heart health, although the evidence is very limited. One study in 18 postmenopausal women showed that drinking sodium-rich carbonated water decreased “bad” LDL cholesterol, inflammatory markers and blood sugar. What’s more, they also saw an increase in “good” HDL cholesterol (20). Additionally, the estimated risk of developing heart disease within 10 years was 35% lower for those drinking carbonated water compared to those on the control water. However, since this was only one small study, significantly more research is needed before any conclusions can be reached. SUMMARY Carbonated water may have beneficial effects on cholesterol, inflammation and blood sugar, potentially reducing the risk of heart disease. However, more studies are necessary. It is not really that harmful for dental health and seems to have no effect on bone health. Interestingly, a carbonated drink may even enhance digestion by improving swallowing ability and reducing constipation. It’s also a calorie-free beverage that causes a pleasurable bubbly sensation. Many people prefer it over still water. There’s no reason to give up this beverage if you enjoy it. In fact, it may actually improve your overall health.